Timber Hex Timber and Landscape hex drive Screws are a 5/16 head & are reusable! 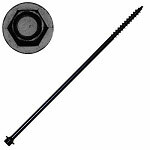 Timber Hex will install faster and have much greater holding power over traditional timber and landscaping spikes. Clearly our Hex Timbers are the Superior Alternative to Spikes. Great for any landscaping timbers connections, log home construction, and other exterior applications. 1000 hour Black Ceramic Coating makes Timber Hex Timber corrosion resistant and treated lumber compatible. ( TH4-ea ) "Timber Hex 5/16 inch Hex Head 4 in Log, Timber & Landscape Screw / ea"
( TH4-50 ) "Timber Hex 5/16 inch Hex Head 4 in Log, Timber & Landscape Screw / 50 ct"
( TH4 ) "Timber Hex 5/16 inch Hex Head 4 in Log, Timber & Landscape Screw / 250 ct"
( TH6-ea ) "Timber Hex 5/16 inch Hex Head 6 in Log, Timber & Landscape Screw / ea"
( TH6-50 ) "Timber Hex 5/16 inch Hex Head 6 in Log, Timber & Landscape Screw / 50 ct"
( TH6 ) "Timber Hex 5/16 inch Hex Head 6 in Log, Timber & Landscape Screw / 250 ct"
( TH8-ea ) "Timber Hex 5/16 inch Hex Head 8 in Log, Timber & Landscape Screw / ea"
( TH8-50 ) "Timber Hex 5/16 inch Hex Head 8 in Log, Timber & Landscape Screw / 50 ct"
( TH8 ) "Timber Hex 5/16 inch Hex Head 8 in Log, Timber & Landscape Screw / 250 ct"
( TH10-ea ) "Timber Hex 5/16 inch Hex Head 10 in Log, Timber & Landscape Screw / ea"
( TH10-50 ) "Timber Hex 5/16 inch Hex Head 10 in Log, Timber & Landscape Screw / 50 ct"
( TH10 ) "Timber Hex 5/16 inch Hex Head 10 in Log, Timber & Landscape Screw / 250 ct"